Katrine shares her love of Barcelona at midnight. When I first moved to Barcelona, I was living in a flat in the center of the city. After a year, I moved to Gràcia. I am not the biggest fan of the night bus, always preferring to walk home, to let my mind wander and gaze at the city in the cool night air. 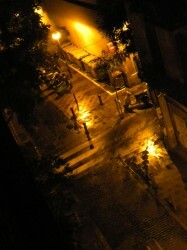 I became fascinated with the nighttime colors and shadows, tumbling over cobblestone, through doorways and windows. Many things catch the eye when meandering through a city, depending on the angle and the time of day, the light and the shadows do many dances, draping over various shapes and leaning towards opposite directions in increasing and decreasing lengths. What is it about line and shadow when it hits that late time at night? I am caught gazing at beautiful balconies, wires that play between windows, shadows tumbling over cobblestone streets, in and out of doorways with a perfect glow of warmth. 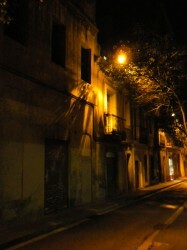 The light turns to a warm hue and shadows draw your attention to cracked walls leaning long across the street.There is a quiet and a beauty that I absolutely treasure meandering through the streets at midnight in Barcelona. Katrine is a freelance graphic designer, currently living and working in Brooklyn, NY. She is the founder of and writer for Urban Artcade, a site containing interviews with international and local artists. Currently, she is curating an exhibit called Las Calles Hablan which focuses on the politics and story of street art in Barcelona. The exhibit will be showing at Mutuo Centro de Arte on 25th October 2012.